Israel's military said it had begun striking "Hamas terror targets" across the Gaza Strip, retaliating for an earlier rocket attack that wounded seven people in a neighbourhood north of Tel Aviv. "The [Israeli Defense Forces] has begun striking Hamas terror targets throughout the Gaza Strip," the army said in a statement. 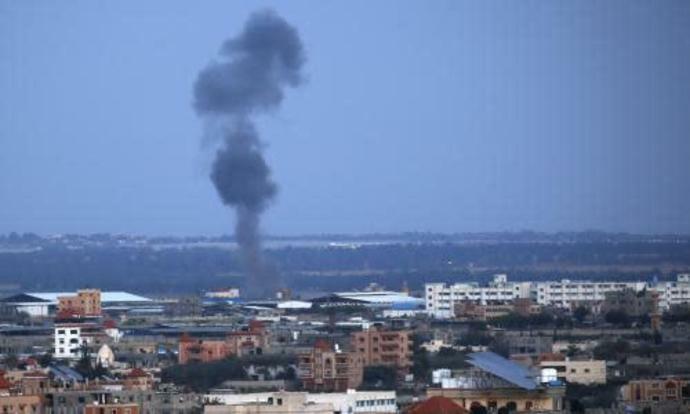 Israel's military said its fighter jets attacked multiple targets across the strip, including a five-story building in central Gaza City it said was a Hamas Interior Security office. The Israeli prime minister, Benjamin Netanyahu cut short a trip to the US on Monday following the rocket attack and had vowed to "respond forcefully". The army said later it was reinforcing troops along the Gaza frontier and calling up reserves. "Israel will not tolerate this. I will not tolerate it," Netanyahu said in the White House standing alongside Donald Trump. "As we speak, Israel is responding forcefully to this wanton aggression." Trump described the Hamas rocket attack as "horrific" and added: "The US recognises Israel's absolute right to defend itself." Gaza's Hamas leaders went into hiding, fearing widespread airstrikes on their bases and other sites in the enclave - the usual response after regular rocket launches during the past year. However, the strike obliterated the home of a British-Israeli family and comes during a period of heightened tension in Israel and the Palestinian territories. With a general election two weeks away, Netanyahu is under pressure from political opponents to hit back hard against militants, even as he as he has been counseled by military advisers of the futility of a fresh conflict. With opinion polls showing Netanyahu running neck and neck with his main opponent, Benny Gantz, the Israeli leader has sought to dismiss him as a "leftist" who is weak on security issues. Separately, this weekend marks the anniversary of a year-long protest movement along Israel's frontier that its troops have responded to with lethal force, killing more than 180 people and shooting 6,000 others. Hamas, which backs the rallies, is expected to call for thousands to attend, while Israel has said it will continue its live fire policy against what it calls "violent riots". An Israeli military spokesperson said Monday's rocket had a range of 75 miles, making it one of the furtherest strikes ever carried out by militants in Gaza. "I have a simple message for Israel's enemies," Netanyahu said. "We will do whatever we must to to defend our people, and defend our state. After this meeting I will return home ahead of schedule, to lead the people of Israel, and the soldiers of Israel." As a result of Netanyahu's early return home, a dinner with Trump was cancelled as well as Netanyahu's scheduled address to Aipac, the pro-Israel US lobby group. In an apparent attempt to de-escalate the situation a Hamas official, speaking to the Agence France-Presse news agency on condition of anonymity, denied the group was behind the rocket launch, and even suggested the projected was automatically fired by mistake following "bad weather". The prime minister's visit to Washington had been seen as an attempt to highlight his close and fruitful relationship with Trump before the election. Trump on Monday signed a proclamation formally recognising Israel's sovereignty over the Golan Heights, a plateau Israel captured from Syria in 1967. The proclamation declared the Golan Heights to be a unique case for security reasons. "Today, aggressive acts by Iran and terrorist groups, including Hizballah, in southern Syria continue to make the Golan Heights a potential launching ground for attacks on Israel," the document stated. "Any possible future peace agreement in the region must account for Israel's need to protect itself from Syria and other regional threats. Based on these unique circumstances, it is therefore appropriate to recognize Israeli sovereignty over the Golan Heights." "This was a long time in the making. It should have taken place many decades ago," Trump said. Netanyahu said it was a "truly a historic day", that "translates our military victory into a diplomatic victory". He said that the Golan was "invaluable to our defences" and claimed that Israel had taken the territory "in a just war of self-defence". He added: "The Jewish people have roots in the Golan goes back thousands of years." The Syrian foreign ministry called the US proclamation a "blatant aggression" on its own sovereignty and territorial integrity. The ministry said the US move represents the "highest level of contempt for international legitimacy". Russia's foreign minister Sergei Lavrov told secretary of state Mike Pompeo that the US intention to recognize Israeli sovereignty over the Golan would result in a violation of international law. UN security council resolutions have opposed the annexation of land acquired by force, and rejected as "null and void" Israeli attempts to annex the area unilaterally.